I am going to introduce you all to the wild and wacky side of training from the Westside. 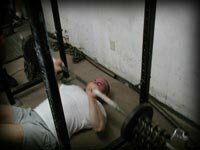 Learn about all the different types of bench pressing (there are 306) and check out pics of many of them. Take your bench pressing to the next level! I am going to introduce you all to the wild and wacky side of training from the Westside. 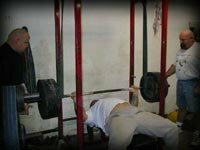 This article will outline the special and innovative exercises used by most ALL big time benchers who are produced through using the Westside Barbell system. Trust me, this stuff works. These movements I am about to outline, though unorthodox and not mainstream, aid to maximum bench press efforts. Guaranteed new PR&apos;s every time. Many of these exercises I have outlined are taken directly from Louis Simmons of Westside Barbell. Some are variations or hybrids of Louie&apos;s, while the main core is from various sources I have accumulated in my 20-something years of lifting. I will discuss numerous exercises because you must experiment with these exercises in order to gain insight to what works best for you. For simplicity, I will describe each exercise to the best of my ability. Sample these 9 exercises and then add the ones you particularly like to your bench program and watch your bench-press increase. ranked from easiest to hardest! First, you must purchase at least 2 sets of 5/8&apos;&apos; chain in 5ft. segments. Each 5ft. segment will weigh 20lbs thus; there will be a total of 80lbs. of chain. The chains are hung from the bar so approximately 1/3 of the chain is resting on the floor when the bar is racked. It will be necessary to buy some lighter chain for the heavy chain to be hung from. The chain offers variable resistance by de-loading the weight in the eccentric phase and loading weight during the concentric phase. This is beneficial because, as the lifters biomechanical advantage decreases, so does the load. On the other hand, as the biomechanical advantage increases at the top, so does the load. This aids in bar speed and force development while minimizing joint stress and muscle soreness. Additionally, the chains force the stabilizers to be worked to a greater degree. Chains are the groundwork of my bench program. This movement is named for J.M. Blakely of Columbus, Ohio. This is an excellent Triceps builder. Usually do this exercise after bench press, or using chains, rubber bands or the floor press. To do the J.M. Press, take a fairly narrow grip, about 18 inches, and lower the bar to the lower pec or pec line. While lowering the bar, squeeze the elbows in toward the body and envision that you are bending the bar. This will help keep you spring loaded. Lower the bar to approximately 4-5 inches above the chest and hold for a count or two. Explode the weight upward. I recommend 3 sets of 3 reps pyramid up to 80% of max for 3 reps. These are simply benches done with the grip outside of the rings on an Olympic bar. Be careful with this exercise because it does place great stress on the shoulders. A positive is that they are useful if you are slow off the chest because it aids explosion at the bottom or start of the lift. I generally focus on these the last 2-3 workouts before a competition because I bench as wide as allowable in a meet. Try for a P.R. each workout on these. After a warm-up, I usually do only 1 set of 5 reps on this exercise. Many times I use chain with this exercise. As a rule, I believe what you can do illegally for 5-reps, you can press 100lbs. more for a single. As the name implies, you will bench while lying on the floor. Begin this exercise by lying on the floor in the same manner as you lie on the bench. Lifting partners will have to hand you the bar. Be sure to start in an extended position. Lower the bar until your arm touches the floor. Pause for a count and explode the bar upward. This exercise is beneficial for overcoming one&apos;s sticking point. Chains can be draped over the sleeve for added resistance at the top. What weight to use? I would start with 50% of your max and then slowly work your way up to 90% of your max. Do 3 sets of 2 reps.
First, you will have to purchase some 2" x 6" boards. Make a set of 2, 3, and 4 boards glued together. Boards represent sticking points. Oh, and you need a partner to assist you. Your partner will place the boards on your chest. Lower the bar to the board and press the bar upward. These are similar to performing Lock Out&apos;s in the Power Rack. This exercise greatly affects the delts and pecs. Again, I would start with 50% of your max and then slowly work your way up to 90% like the floor press, and then use 90-95% of your max each set. Do 3 sets of 1-reps.
You will need a partner or 2 for this exercise. The attendants should help the lifter by handing out the weight as if giving a liftoff. The lifter should hold the weight in the extended or locked position for 10 seconds. Eventually, you should be able to hold 150-200lbs. more than your max for 10 seconds. This is useful for a lifter to feel heavy weight while alleviating the micro-trauma associated with an exercise with a full-range of movement. Very similar to doing heavy walk outs with squats. 3 sets. Speed. Developing speed, explosive power in the bench press is what this is all about. First, you must purchase 2 sets of bands. If you cannot afford a pair, no problem usually most gyms carry exercise band sin the aerobics room. Damn that aerobics room is good for something other then occupying space. The bands are attached to the bar and then to the side of the bench. Make sure they are tight and taught. Usually these exercise bands come in different colors for different tension levels, green (easy), red (harder), ECT. Start with the green band working your way upto the red and then using both the red and green. Very colorful. The band offers variable resistance by quickly de-loading the weight in the eccentric phase and loading weight during the concentric phase. This is beneficial because, like the chains, as your biomechanical advantage decreases, so does the load. On the other hand, as the biomechanical advantage increases at the top, so does the load. Bands also make you stay very tight, or in laymen&apos;s terms, you have to stay tense. You cannot get relaxed while using bands they&apos;ll take you right through the bench if you rest of one minute. This aids in bar speed and force development while minimizing joint stress and muscle soreness. Again, like using chains, bands force the stabilizers to be worked to a greater degree. Bands are the foundation of my bench program. Use about 65% of your max. You will need to purchase a heavy-duty Swiss ball for this exercise or hopefully your gym has one, they can usually be found in the Aerobics room. Lie on the Swiss ball with the shoulders and upper torso on the ball and the hips and legs off the ball placing your feet in the same position as if you were on a bench doing presses. Have 2 people simultaneously hand heavy dumbbells to you. Start with the dumbbells at the top, and then lower until the arms touch the ball. With practice, the lifter can use the ball as a spring-like mechanism to aid in the initial phase of the pressing of dumbbells. This ballistic action will allow heavier weight to be lifted as well as additional reps to be performed. Do 1 set timed for reps with as heavy dumbbells as possible. Time for one set is 1 minute. Get a stopwatch or have your partner watch the clock for you. This repetition method will aid in muscular endurance. Personally, I utilize these in developing my bench program too, along with band work. Don&apos;t jump into these with what you usually use on a flat bench, remember the ball moves around, get used to it first I started with 40-pound dumbbells. Within three weeks you should have graduated to close to max weight. I did 80-pounders for 1 minute 42 reps! Talk about a burn! Now let&apos;s see if you got the guts to be different in your gym. Guts you ask. Well, everyone wants a bigger bench but most everyone is afraid to drop their poundage&apos;s to achieve this level and most I&apos;ve talked to, outside of serious competitors, everyone is afraid to back off even for a few weeks. Then, I guess you can always stay with the same weight and small chest and toothpick arms while the rest of use enjoy the fruits of being on the Westside.